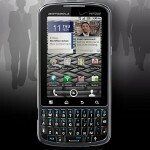 With identical specs as the Motorola DROID Pro, but the European 3G frequencies front and center, the Motorola PRO is coming to Europe at a yet-undisclosed time and price. The business-oriented handset sports a 3.1" display with 320x480 pixels, 1GHz TI OMAP3 chipset, 512MB RAM/2GB ROM, and a 5MP camera with dual LED flash. The main added value here is, of course, the physical portrait QWERTY keyboard beneath the screen for the suit types. The enterprise orientation of the Motorola PRO is further affirmed by the AuthenTec IPSec multi-headed VPN integration, remote wipe of device and SD card, and complex password support, as well as device and SD card encryption. The Motorola PRO will be hitting Europe with Android 2.2 Froyo, and there will be a desktop dock, sold separately, to charge it, use as an alarm clock or have a local weather reading on display, as well as play music or use it as a picture frame when docked.